LONDON--(BUSINESS WIRE)--According to the latest market study released by Technavio, the global metal biocides market is expected to grow at a CAGR of close to 5% during the forecast period. This research report titled ‘Global Metal Biocides Market 2017-2021’ provides an in-depth analysis of the market in terms of revenue and emerging market trends. This report also includes an up to date analysis and forecasts for various market segments and all geographical regions. 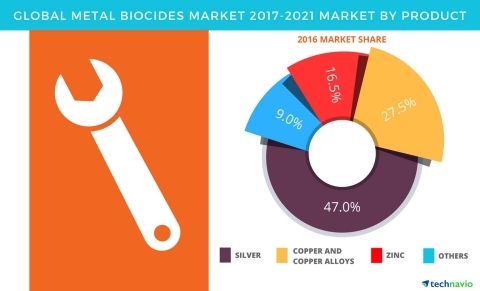 According to Hitesh Bhatia, a lead analyst at Technavio for metals and minerals research, “The growth in the global metal biocides market can be attributed to the increasing demand for metal biocides from various industries, especially the building and construction, marine, and medical industries. The medical application segment accounted for the largest share in the global metal biocides market in terms of value. Copper and silver-based metal biocides are used in many medical applications, such as medical textiles, medical device coatings, wound dressings, sterilizing agents, and others. The effectiveness of silver nanoparticles against infections is expected to drive the demand for silver-based biocides in the segment. Medical tourism is gaining prominence globally. This is attributable to the low treatment costs and availability of skilled healthcare professionals. Outbound medical tourism is mainly originating from the US due to the US Patient Protection and Affordable Care Act. This has opened novel avenues in the medical industry globally, generating significant revenue in various dependent fields, of which metal biocides hold a prominent share. The paints and coatings segment is expected to have the highest CAGR by revenue during the forecast period. The growing demand for metal biocides in household paints, marine antifouling agents, and varnishes is fostering the market growth in the segment. The growing urban population is increasing the demand for new residential buildings globally. According to a United Nations estimate, as of 2015, it was estimated that more than 56% of the world’s population resides in urban areas, and this is anticipated to witness an increase by almost 5% by 2021. The increase in population and changing lifestyles are contributing to the growth of the building and construction industry. The increased per capita income from countries such as China, India, the Philippines, Indonesia, and Thailand is also expected to drive the demand for metal biocides. Metal biocides are commonly used in disinfecting agents used in food containers and is also used to control the microbial growth in foods and beverages. They are also used to increase the shelf life of foods and beverages by protecting them against deterioration caused by the microorganisms. The metal biocides are commonly considered as food additives and are regulated by the Food Additives Directive 89/107/EEC. These biocides must be explicitly authorized at European level and must undergo a safety evaluation before they can be used in foods and beverages. “The increase in the use of packaged and processed foods and beverages in countries, such India, China, Brazil, and Indonesia are expected to drive the demand for metal biocides in the food and beverages application segment during the forecast period,” says Hitesh. Become a Technavio Insights member and access all three of these reports for a fraction of their original cost. As a Technavio Insights member, you will have immediate access to new reports as they’re published in addition to all 6,000+ existing reports covering segments like olefins, industrial gases, and specialty chemicals. This subscription nets you thousands in savings, while staying connected to Technavio’s constant transforming research library, helping you make informed business decisions more efficiently. According to the latest market study released by Technavio, the global metal biocides market is expected to grow at a CAGR of close to 5% during the forecast period.